Had an awesome, wonderful, sweet Mother’s day! the best husband in the universe got me stunning roses, the kids got me cards that broke my heart. After spending the day at a water park, we got the kids tucked in to bed all nice an early. Rather then draw I piddled around cleaning my drafting table and rearranging my wacom and computer space. Grrrr. You know…Avoidance mode!! 2. it really IS easier buy clothes rather then do laundry (AND FOLD) and put them all away for a family of 5… so I surrender! Just a bit a day. My goal this year still 1 page a week, 16 pages an issue, 3 full issues a year. I….gotta draw a lot more. So off to doodle for a bit. Oh, but I DID have to watch Game of Thrones! We are addicted to this show! I’ve not read ‘Dance with Dragons” — kinda got the same thing going on with this series as I do with the Potter series–I can’t read the last books. It’s a quirk. But Martin give one of the best character driven stories EVER. 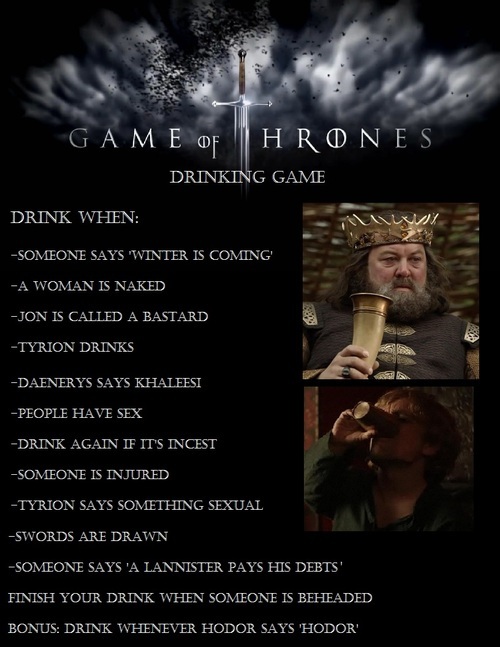 Did you know it also makes a great drinking game? AwEsomely fun day. Hung out at Ka-Blam , made with some comic book work, saw Avengers (LOVED IT!–NOTE: stay to the very, very end well past the traditional credits–just sayin’). Snuggled w/ the family tonight– Pure BLISS! Being the nerds and geeks we are on Saturday (May 5) at 11:35 p.m. EDT, the moon will officially turn full. And only 25 minutes later the moon will also arrive at perigee, its closest approach to Earth — a distance of 221,802 miles (356,955 kilometers) away. In short–BIG moon, about 11:30 pm tomorrow night–it’ll look AWESOME!